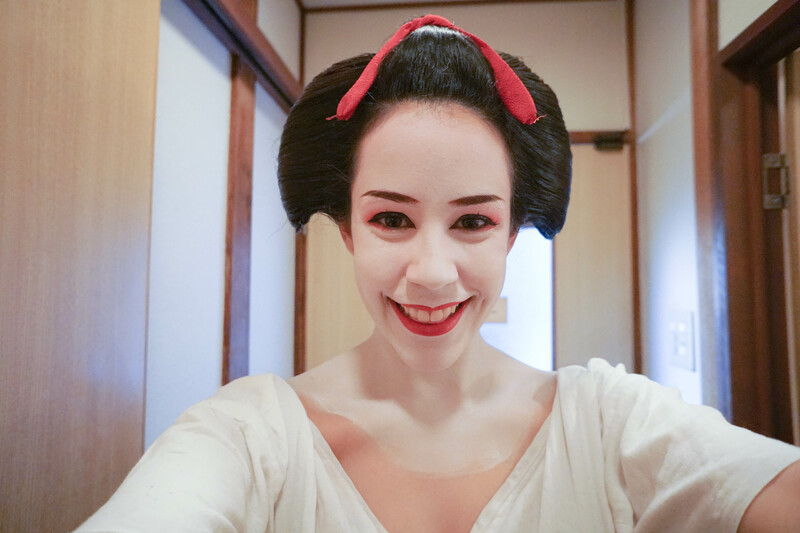 One of the best Japanese bucket list experiences a visitor can try is “henshin,” or the professional makeover into a Maiko or Geisha. 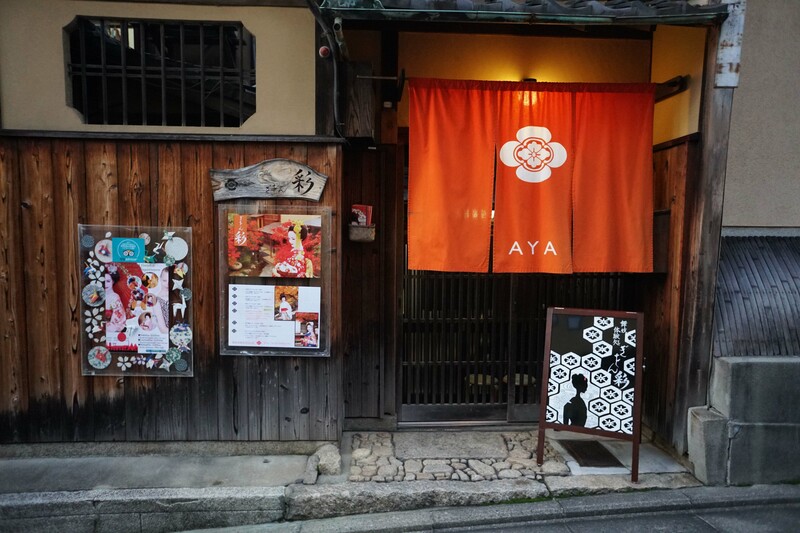 We visited the popular studio AYA Gion in the historic Geisha District of Gion. This studio is in an authentic teahouse where Maikos once performed. Every thoughtful step of the complicated makeup process represents something meaningful. There is even a thin area at the hairline and behind the neck that are purposefully left unpainted to remind onlookers that Geishas wear a mask. The most common misconception around traditional Japanese Geishas that started during the post-war occupation of Japan was that they are glorified prostitutes, but that is not true. Geishas are trained as musicians and performers. The Japanese word Geisha translates to artist. The first Geisha performers in year 1730 were actually men until it became a mostly women-dominated profession by 1780. Thank you AYA Gion for providing this complimentary makeover in exchange for my honest review, but as always all opinions are my own. 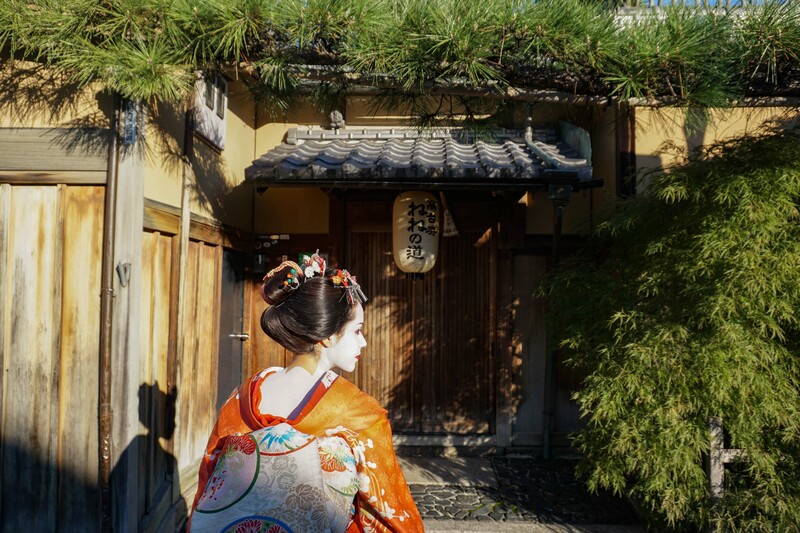 What is the difference between a Geisha and a Maiko? 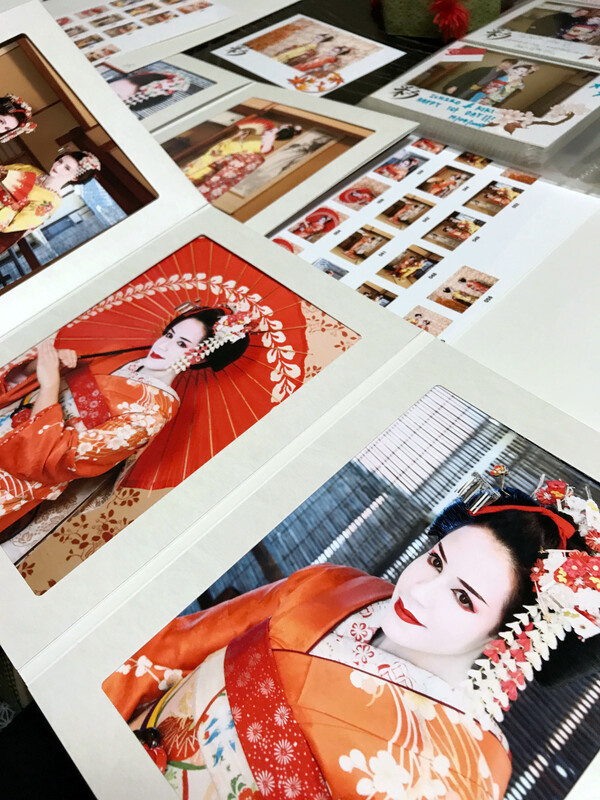 Upon arrival at AYA Gion studio, pictured above, you are asked if you want to be made up into a Maiko or Geisha and which poses you would like to do during your 10-minute photo shoot. The popular images of a Geisha with extravagant long-sleeved kimonos and sparkling hair accessories are often actually Maiko, not Geisha. 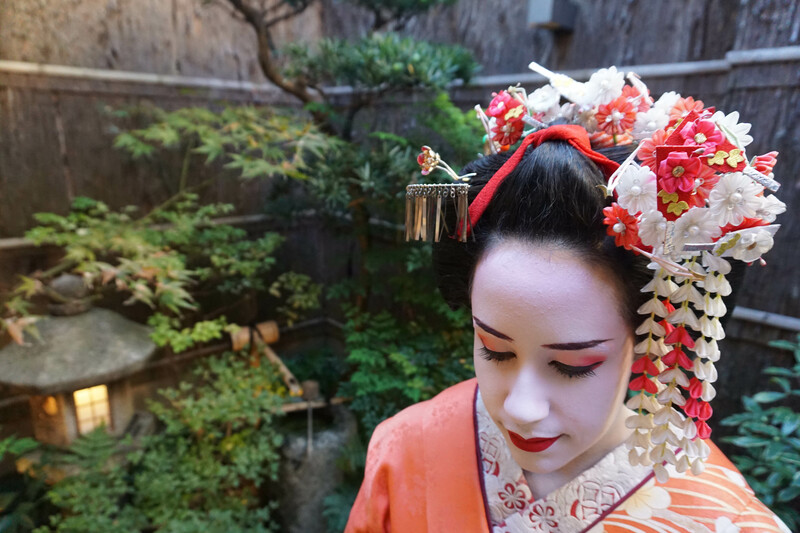 The Maiko style is more popular, as it is a younger apprentice version of a Geisha. The Maiko makeup style is meant to be cuter and more youthful than the more elegant Geisha makeup style. The transformation takes a little over an hour, many layers of makeup, and many heavy layers of clothing, but is so worth the wait. 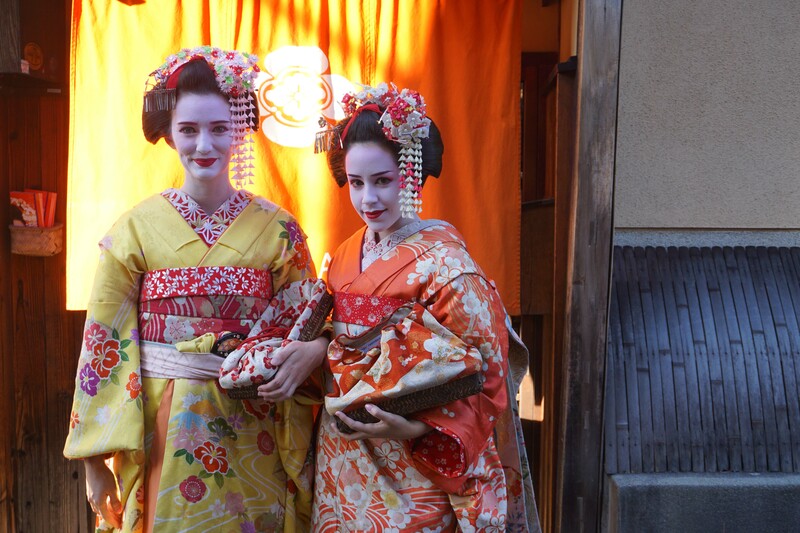 At first glance I thought many visitors in the attire were real Geishas, and we were even mistaken for Geishas! 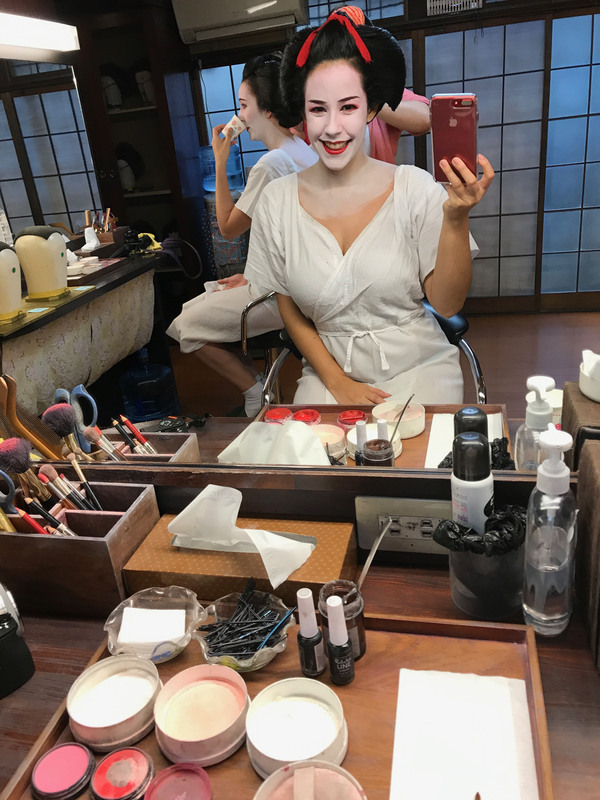 Here is the step-by-step process of what to expect when you transform into a Geisha or Maiko at AYA Gion in Kyoto. 1. When you first arrive, you take off your shoes and see lines of traditional wooden flip-flop styles you will wear later for photos. 2. You are given a menu of styles to help you choose between becoming a Geisha or Maiko. 3. Head to the bathroom to change into your robe, Maiko undergarments and tabi split-toe socks. There are lockers to keep your things. 4. Meet your makeup artist in the makeup room. 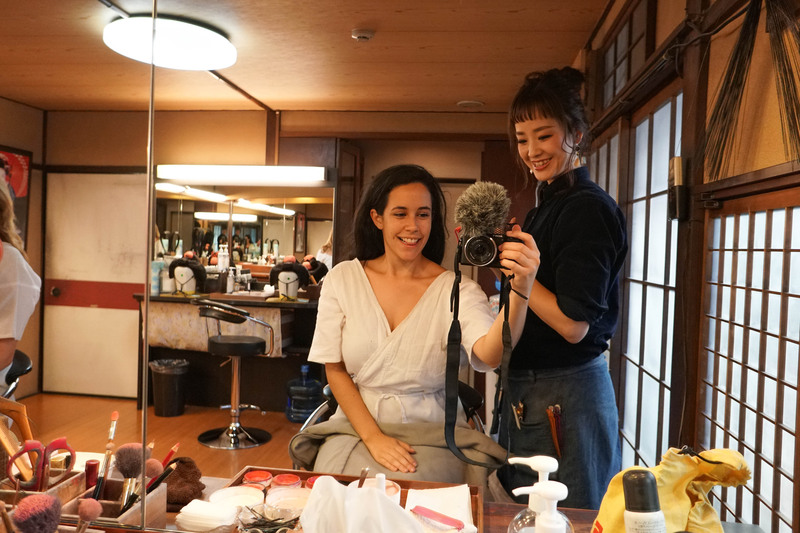 My makeup artist was Yoshiko, and she was so nice and friendly. She even helped tell me which angle was best to set up my camera for a time-lapse video. 5. She removed any makeup on my face with baby oil. 6. She massaged a wax primer base on my face. 7. White makeup is painted on with a traditional brush and blotted on with a sponge on your entire face and front and in a “w” shape on the back of your neck, pictured below, symbolizing the mask a Geisha wears. 8. Pinkish-white makeup is added around your eyes to add to the youthful style. 9. Pink eyeshadow is applied to the eyelids. 10. Red eyeliner is applied under your eyes and red eyebrow pencil is used to define your brows. 11. Black eyeliner and mascara is added to your eyelids for definition. 12. Red lipstick is applied to your lips. 13. Front and side sections of your hair are pulled out to help hide the traditional wig, making it look like your real hair. 14. The wig is placed on top of your head and pinned in with bobby pins. 15. Your hair is smoothed around the wig, and if you do not have black hair, they provide temporary black hair spray to complete the look. 16. 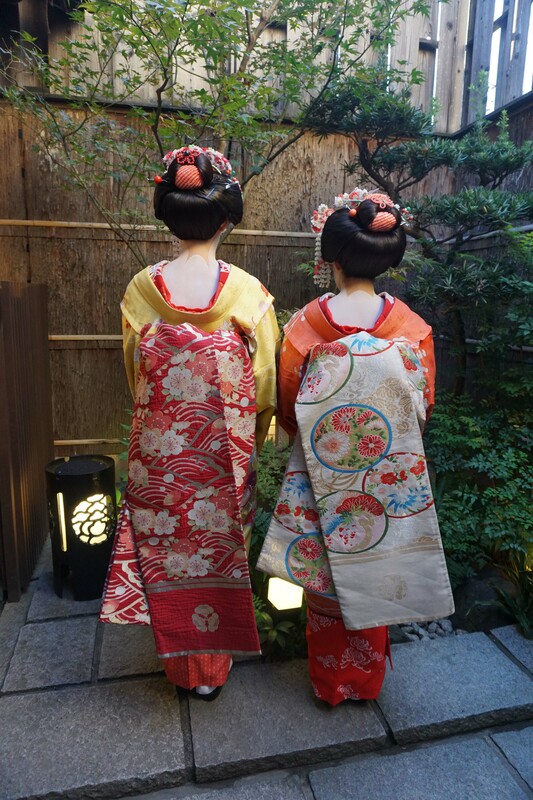 Maiko are known for their decorative hair ornaments. You can choose from a variety of pretty hair accessories. 17. 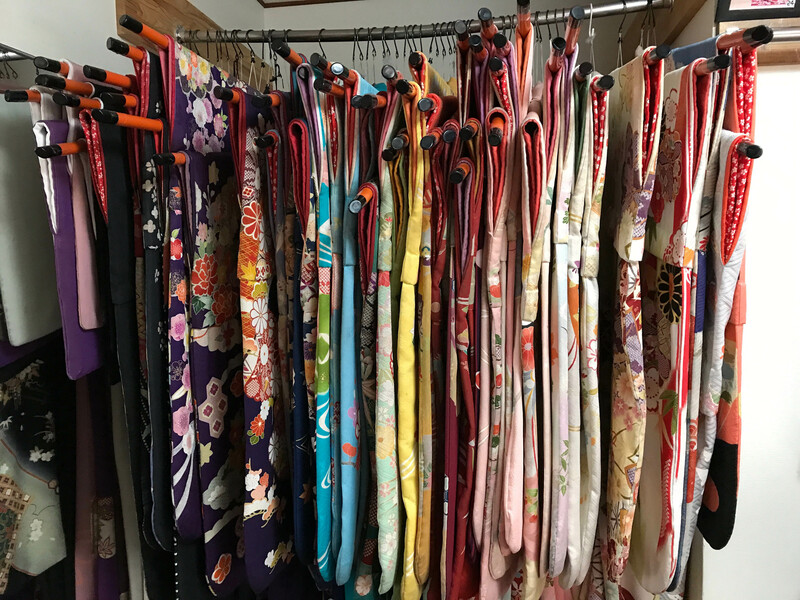 You are escorted upstairs to select your Kimono outfit from dozens of beautiful colors and patterns. Size was not a big concern, as they fold and tuck the kimono up around your waist to adjust for your height. 18. You are then dressed in about a 15-step layered process, from underclothes to waste cords and an obi or sash with a structured bow in the back. 19. The studio and courtyard are available for photo shoots. The photographer helped us choose our poses from a menu of options and directed us on how to get into each position. The layers were very heavy and tight, so it can be difficult to walk far if you opt for a walking package, but the photos we took in the courtyard and studio were amazing! 20. Each package option comes with a minimum of 10 minutes of free photo time where you can take photos on your own. Our makeup artists were very helpful taking photos and video clips of my friend Monica and me as we posed, spun and bowed getting into character! 21. Head to the changing room where you are given everything to remove your makeup, shampoo to wash off hair spray and even a hair dryer and towel. 22. At the end, you receive photo prints, top shots chosen by the staff, and you can order additional photo souvenirs. 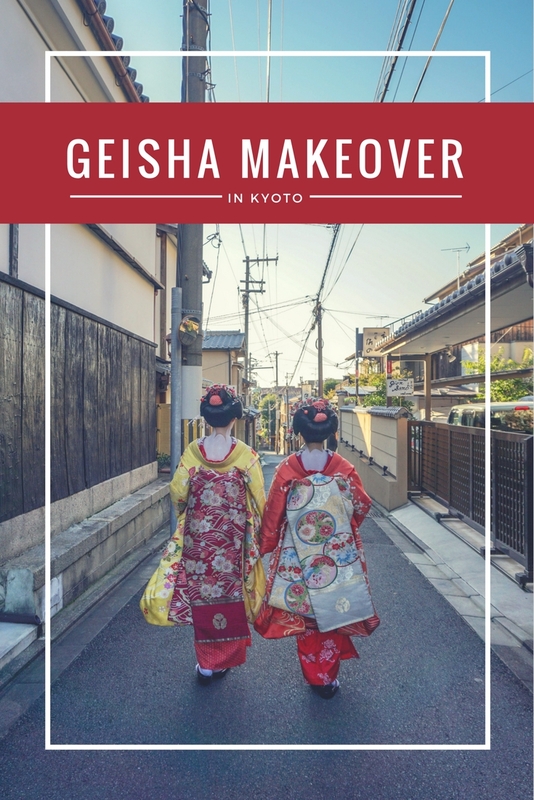 I highly recommend this experience to everyone visiting Kyoto who is interested in learning more about this process and walking (or waddling) a day in the shoes of a Geisha. The makeup artist and staff were so helpful and attentive to our questions and concerns. This experience definitely belongs on the top of any Japanese bucket list. For more on this experience read my friend Monica’s blog here. For where to stay in Kyoto read my review of Suiran Hotel here. This was an experience of a lifetime! I loved literally EVERY second. Yes it was, such an amazing experience of a lifetime! Thanks for this great insight. Any idea on costing at all ? Is there only one package available?